The user can then interact with the message if they wish, allowing it scroll across, pause it or view in a standard dialog box. 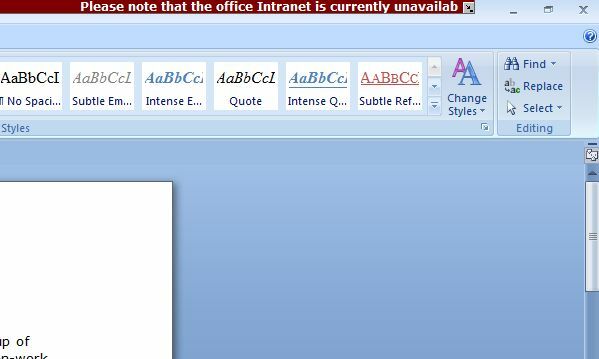 If required, it can be sent to the Notification Area (system tray) where it remains until it either expires or is replaced or cleared by the Administrator. 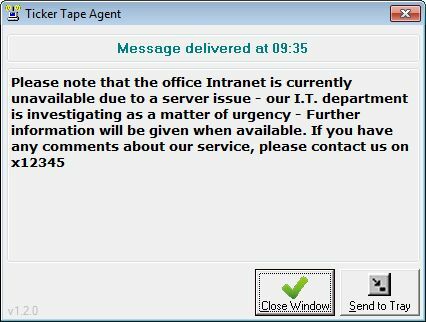 Ticker Tape is a simple way to 'broadcast' unobtrusive messages to workstations spread across multiple disparate Sites - it's ideal for Service Desks or Administrators wanting to proactively advise people of issues affecting them and is especially useful where other means of communication, such as email, are unavailable due to outages. 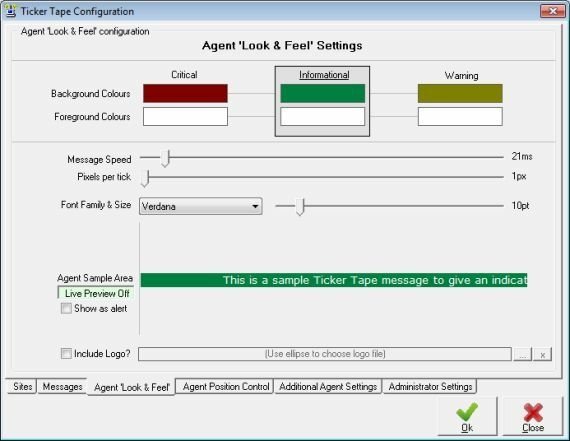 Its intuitive administrative interface allows you to choose from a range of previously defined ‘template’ messages, construct your own ad-hoc message or control the Agent software across multiple Sites - and thousands of users - with just a few clicks. 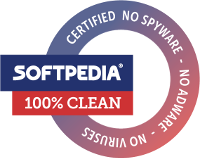 The completely free unlicensed version of Ticker Tape is identical in all respects to the fully licensed version, other than it can only manage messages for up to three individual Ticker Tape ‘Sites’ (however, each Site could contain thousands of workstations). No functionality is lost and there are no annoying ‘nag’ screens to contend with! If you wish to manage more than the three Sites, there are several very cost-efficient license options available, allowing you to manage up to a maximum of 42 sites which could be spread across the globe. Licensing only takes a few minutes and the received license code can be immediately used within your existing Ticker Tape installation. 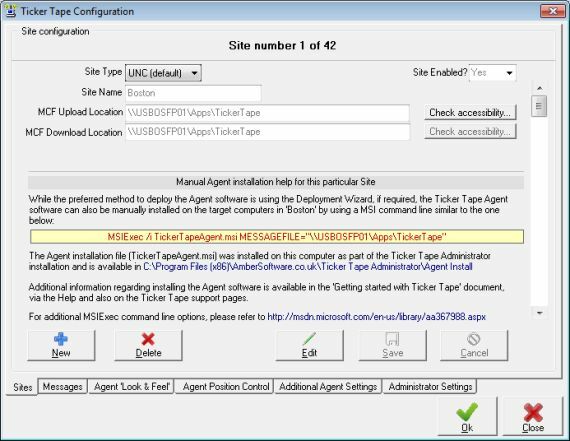 The 'Live Preview' function also allows you to mimic a real Agent to see exactly how the message would look at the target workstations as its configuration is altered in real-time. As well as its built-in help, information about Ticker Tape can also be found in the Documentation and F.A.Q. areas of the Support pages. 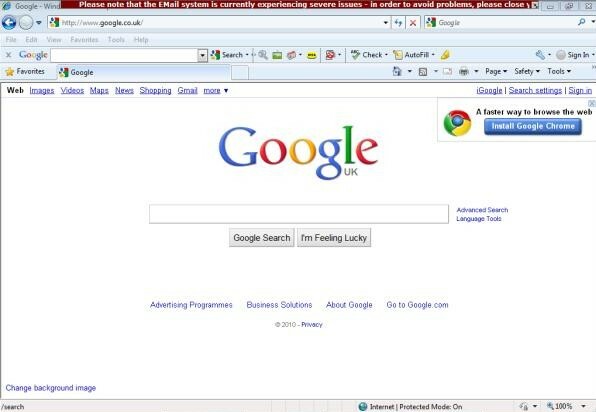 The recommended environment for Ticker Tape is at least Windows XP - however it has also been tested and works on Windows 2003, 2008, Vista, 7 and 8.1. We hope it’ll work fine for you but if you do encounter any problems, it’s likely that there’s already a knowledge base article available but if you do need any additional help, please don’t hesitate to send us an email or submit a support ticket - we’ll do our best to help you. If you have any suggestions on how to improve Ticker Tape, please let us know also - customer feedback is important to us and your suggestions are used to guide the future direction of Ticker Tape. As an added incentive, if your suggestion is incorporated into a future release, you’ll be credited in the software! 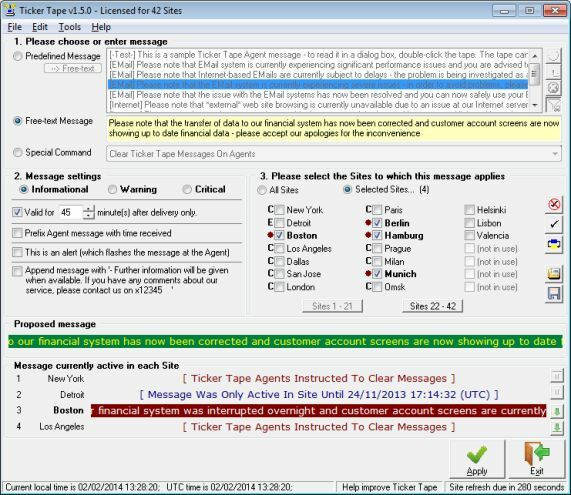 If you wish to manage more than three Sites with Ticker Tape, cost-effective licenses are available, allowing you to manage up to 42 Sites in total - an appropriate license code can be securely purchased via our commerce partner, Share-It!, by following one of the links below or via the ‘Help/Enter License Key...’ option in the Ticker Tape Administrator software - a wide range of payment options are available including credit card, faxed purchase order & PayPal. Already using Ticker Tape and want to help improve it? Take this very short survey!